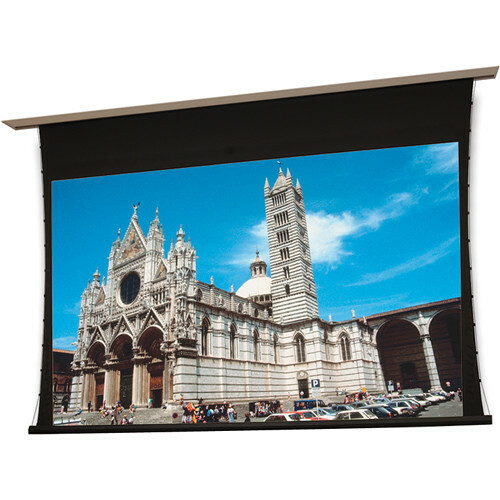 The 102804SCL 162 x 216" Access XL/Series V Ceiling-Recessed Screen with LVC from Draper is a tab-tensioned front projection screen designed for larger rooms over the standard Access/Series V. The white extruded aluminum case installs above the ceiling, and a trim flange conceals the opening cut into the ceiling. The surface and roller can be installed at the same time, or easily added later. The low voltage controller is built into the motor, simplifying installation. The LVC is compatible with IR and RF remotes and receivers (sold separately), which can be used to control the screen from your couch or even another room. The included 3-button wall switch operates the screen and sets limit switches. As a part of Draper's ClearSound family of acoustically transparent screens, the perforated ClearSound NanoPerf XT800V surface allows you to place your speakers behind the projector screen. This setup is ideal for home theater use in rooms where space is restricted. Microscopic perforations in the fabric allow the audio to come through the screen, without compromising audio quality. Black backing helps control ambient light coming from behind the screen. The surface provides accurate color reproduction and a full 180° viewing cone, with a gain of 0.8 at 0°. The PVC fabric surface can be cleaned with mild soap and water.